What's trending now and what has fallen out of favor? As you start thinking about your project, you'll find it extends beyond selecting cabinets, appliances and countertops. You'll want to know what others are choosing for the best in functionality and purposeful design, as well as which colors are meant to be loved right now — and what's looming on the horizon. Take a look at simple style and linear influences as you plan your home to reflect your personal style. Cabinet color trends reflect much more than a particular hue that happens to be popular at the moment. Colors are a true reflection of the way people want to feel inside their homes, based on what is going on around them, and how they want to live right now and into the future. Any time color is drawn from nature, you can't go wrong. From deep blues that reach from sky to water and every nuance in between is current today. Other hues topping the list of current color trends, contains almost any variation of white. Pure and crisp white to those that fade to gray and khaki are topics that are on trend for today. In fact, gray in any shade is on the list for today's homeowner. Add texture to the mix and capitalize on the sense of touch within a room for a tactile and visual experience. As we decide to stay in our homes longer, cabinet design trends are shifting to reflect kitchens and baths designed with purpose, style and overall function in mind. Today's cabinets not only look beautiful, but they accommodate our needs for more storage and better organization for easy living. Deep drawers and open shelving keep items close at hand and easily accessible. Cabinetry that looks like furniture and harmoniously blends with room architecture is paramount to homeowners, and tops their wish-list. We have seen a surge of the use of horizontal detailing both in cabinetry layout and wood grain direction. Clean lines and uncluttered looks are at the height of popularity, featuring minimal use of wall cabinetry, and lineal stretches of base cabinets whenever possible. Horizontal grain direction offers a more modern vibe and adds the illusion of texture to the overall presentation of the room as well. Clustering cabinets together for functional use makes good sense for work flow. With Omega, for example, you can incorporate an ironing area right into the cabinetry. For the best in functional use, make sure to plan plenty of storage cabinetry for the iron and cleaning supplies as well. Perhaps you'd like full height doors with roll-out trays hidden behind, or deep drawers that glide right to you, with a gentle pull. Whichever way you choose to store, you'll find that grouping like areas together — made from the appropriate cabinetry — helps complete any task quickly and easily. For design flexibility in the long term, cabinet door styles are becoming more simplistic, using clean and clutter-free lines. This kitchen trend is making uncomplicated cabinetry styles a popular choice in homes today. As a quick guide, doors with raised center panels tend to lean toward the traditional — even more so when the door includes ornamentation like roping or applied mouldings. 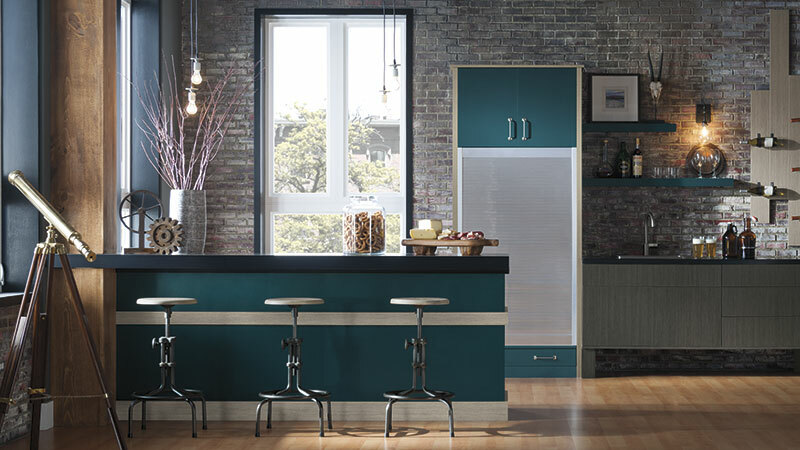 Flat center panel doors are at the height of popularity now, invoking a casual, yet elegant feel, and are perceived as doors that are easy to clean, leaving more free time for actual living! Slab doors evoke a more modern feel with no ornamentation and a very simplistic countenance, allowing the room architecture or cabinet finish to take center stage. As homeowners, we continue to gravitate toward open floor plans, creating a kitchen trend of cabinetry designs that have an easy and casual design flow from room to room. Using cabinetry with complementary designs and colors can create an appealing segue in a multipurpose area, such as a kitchen that opens up into a family room, or a large bath adjacent to a dressing room. One thing is for certain, everyone wants the ability to be together, particularly close to the kitchen! Mid Century modern looks are a growing kitchen trend in today's homes. As this motif has become timeless, it is captured in kitchen and bath designs with both horizontal and vertical lines of wood grain and color accents. Forms and shapes that are simple and bold are representative of that iconic time period, and yet speak to up-to-the-minute style. As technology increasingly connects our world, today's homes are incorporating cabinetry details that can accommodate the way we live now, whether it's choosing cabinets with built-in charging stations for electronics or creating beautiful in-home workspaces for laptops and tablets. Architectural effects that evoke industrial spaces make their way into home interiors, with exposed brick, blackened and burnished materials and slabs of concrete or natural stone. In kitchens and baths, this design trend can be enhanced through hardware and cabinetry with industrial-like metals and contrasting material for a look that can appeal to those looking for an urban vibe, something a bit more rustic or even more of a simplistic and spare scenario. The hand-crafted panache of cabinets that feature eclectic styling offers a backdrop for many other design elements — from beautiful artwork to collectibles from global adventures. At Omega we'd love to create the design of your dreams — from cabinetry shapes that inspire and intrigue, to door styles with unique detail and materials. With craftsmen and women who are skilled in creating artisan looks just for you, you'll love what we offer at Omega.